When some people walk out of the door after a jazz performance and say ‘thank you, what a great evening,’ you must that something is right. When a number of people all say the same thing with broad smiles then you know that this is the kind of music that works like a charm. This was the very pleasant situation on Monday evening. 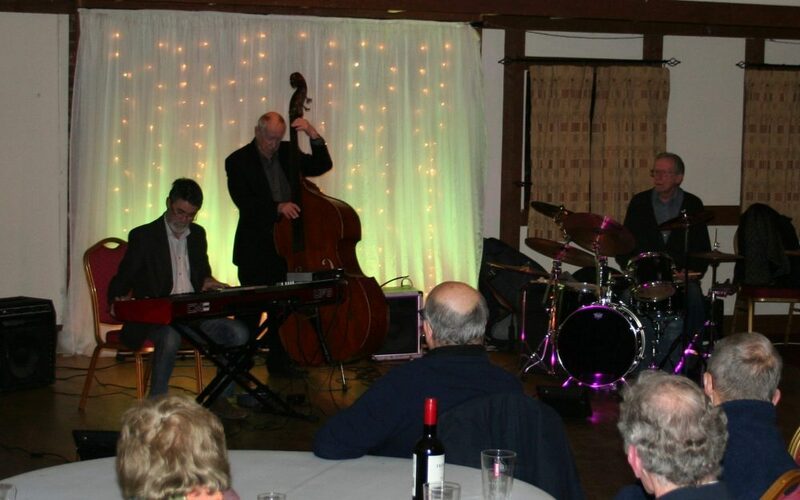 Zoltan is well known to local audiences and so were the other musicians, although pianist Tom Berge and drummer Billy Weir might be regarded as ‘new boys’ although they have played at the Berkeley before but they settled in without any problem at all. In fact full marks to them for the way they conveyed the music which was way before their time. The remaining members of this quintet cut their teeth playing this kind of music. Swing with a definite Goodman theme. Zoltan played clarinet throughout the evening making sure that the theme was faithfully adhered to. Paul Sawtell played the part of Lionel Hampton on vibraphone. Clive Morton who has probably plucked his bass strings for many big showbiz names, played with flair and just fitted in so well. The programme too was put together with some thought with Zoltan crediting both the writers of the songs and whether they put Benny into the hit parade of the time. It really was quite simply that if you were a fan of Goodman music then this evening was heaven-sent for you. And even if you weren’t particularly dedicated to that era, you could still have enjoyed an evening of really swinging jazz and be very well entertained at the same time. I think a few more evenings like that would sit very well in the Berkeley’s calendar. Without really having heard this group before, a departure from the norm, no one really knew what to expect. I think that applied to most of the audience. One exception was a group of people turned up having heard this trio just two days previously and liked them so much that they came again for more. ‘You won’t be disappointed’ was their comment as they came in. The evening was filled with a variety of music, everything from the Beatles to Bobby McFerrin with loads of variety in between including many items with a label which said ‘Hot Club’ or ‘Django’ No surprises there, after all the trio are billed as a modern manouche project. A surprise item came about when a member of the audience, who had brought his violin to the party, was invited to play during the second half. He did and was roundly applauded and invited to play some more which he did. 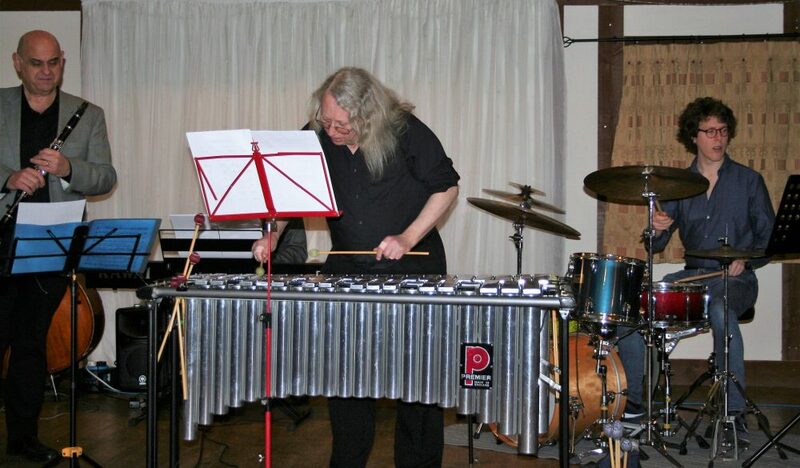 This was Pete Hartley who can play in many styles of music – classical, chart jazz, bollywood, Irish, Jewish and so the list goes on. But when it came to swinging jazz, Pete was certainly not lacking in that department. This doesn’t undermine the talent of the trio whose repertoire was all encompassing. 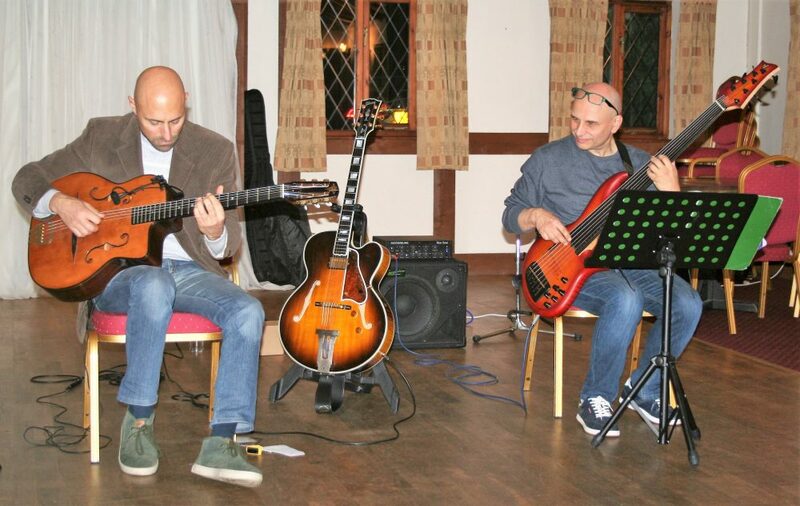 Dario Napoli on guitar was the leader backed very ably by Tommaso Papini on rhythm guitar with Albert Vigano supplying the bass line – a seven string bass guitar, because as Dario explained they had travelled to the UK by car. Flying with instruments is a nightmare and to bring a string bass in the boot of a car could prove to be difficult! 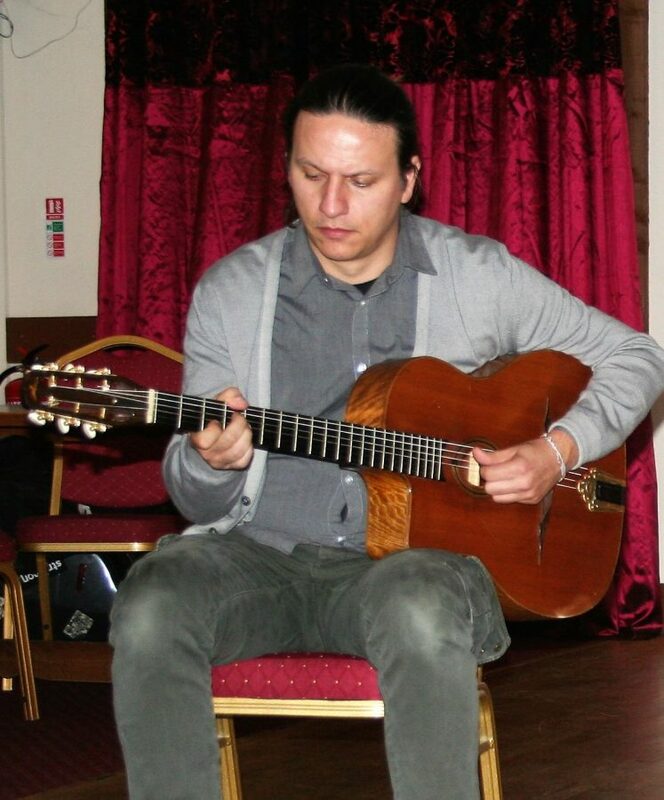 If you came along and expected gypsy jazz all the way with nothing else, then I think you might have been a little disappointed. If you came along with an open mind and enjoyed swinging jazz together with a variety of music, played with a number of strings, then I guess you would have been delighted. Playlists are very important when musicians play to an audience who love their jazz. The musicians have to judge the audience; age, type etc and compile the tunes they think will be enjoyed by those who have paid their money to hear them. It’s not an exact science but so many bands that tend to play at a lot of jazz clubs know the form well. Chris Gumbley and Bryan Corbett certainly knew the form. They turned up with a fairly average list of tunes. I suppose you could call it a safe programme for this Monday evening. What was missing was any idea that the arrangements would be more than just a bit different and perhaps because they were different, more enjoyable. Not different enough to alienate, but just with some extra added variations which would add some spice to the evening. A small for instance, Night in Tunisia had Bryan add a few passages with a growling trumpet which I don’t seem to remember Dizzy ever doing. It just added another interesting dimension to the whole thing. Then there were performances of Joy Spring. I am told that is not the easiest piece of music to get right. It might sound a fairly simple tune but if you play it incorrectly, then you soon get found out. They didn’t get caught out. Another example of inventiveness is Bernie’s Tune. It was very fresh when Gerry Mulligan introduced this tune composed by Bernie Miller in his 1952 piano less quartet, but because it’s easily memorable melodic music which has stood the test of time, you could be excused for thinking that there aren’t many other ways in which it can be served up. You would be wrong, very wrong. This group of four with the ever inventive Al Gurr on keyboards and superb bassist Ben Markland came up with yet another, fresh version which was served up in a way that was delightful. Their A Train was a really great performance, way in front of what could be dished up by just playing it safe. All in all the evening was full of very pleasant surprises in the music on offer. The titles might have been same old, same old but the performances shouted new and original. 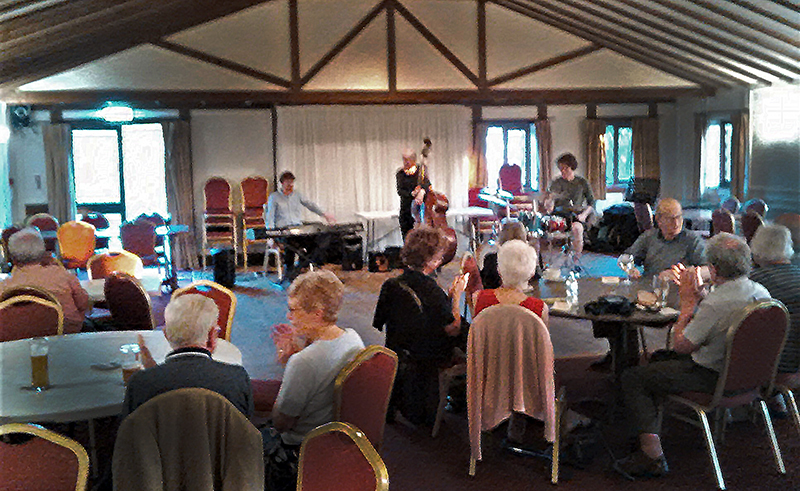 There were of course others as well, but all in all a good evening of beautiful renditions of great jazz. When this band came to Severn Jazz in 2016, I seem to remember their performance was billed as ‘west coast jazz’ or at least in that style. When they played, there was a tendency to veer off into the ‘our own composition as featured on youtube’ brand of jazz. If you add in the use of a bass guitar instead of the upright string variety, then some members of the audience were disappointed. And of course they said so. But that was in 2016. Here we are at the beginning of autumn in 2018 and here is the quintet again with a very different programme of music. Those comments after their first visit were passed onto Richard and this time it was all as our audience liked. At least I didn’t hear any dissenting voices. The upright bass was there and the programme was full of music which was familiar to everyone. In short, it was an evening of great music well-played. 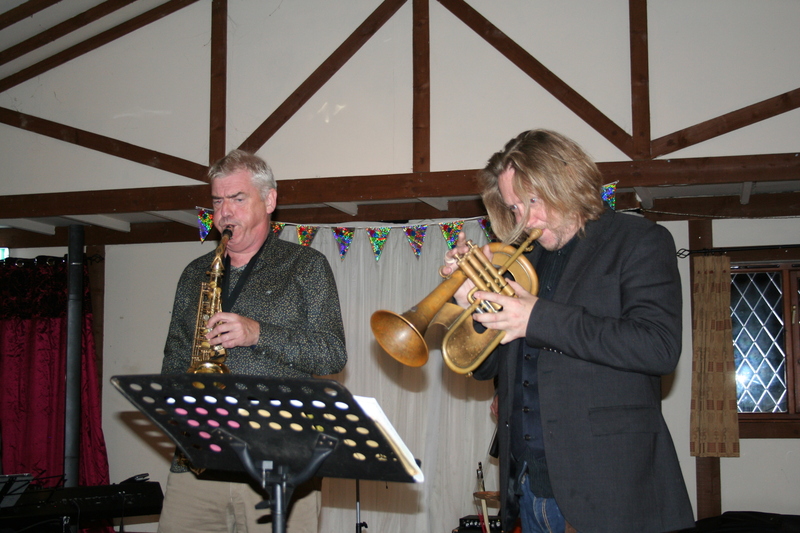 There were also some lovely moments like when drummer and bass player had a bit of a duet. You could see they were enjoying it immensely and so were the audience. It was fun as well as very well played enjoyable music. This is what jazz is able to do so well and when it is done well as it was on this occasion, it is so worthwhile. The musicianship of the quintet has never been in question. They unnerved some people at the beginning of the evening who thought they were going to be very loud, but we were assured that was only the sound check and it would alright on the night. It was. I gathered from Richard that jazz is not as big a part of his musical life as he would like. I think to be very fair, with the standard of this band they deserve to get more purely jazz gigs. To end the evening, a member of the audience who was just visiting the area asked if they could say a few closing words. This can be a dangerous situation. Who knows what could be said and how long the audience might be detained. 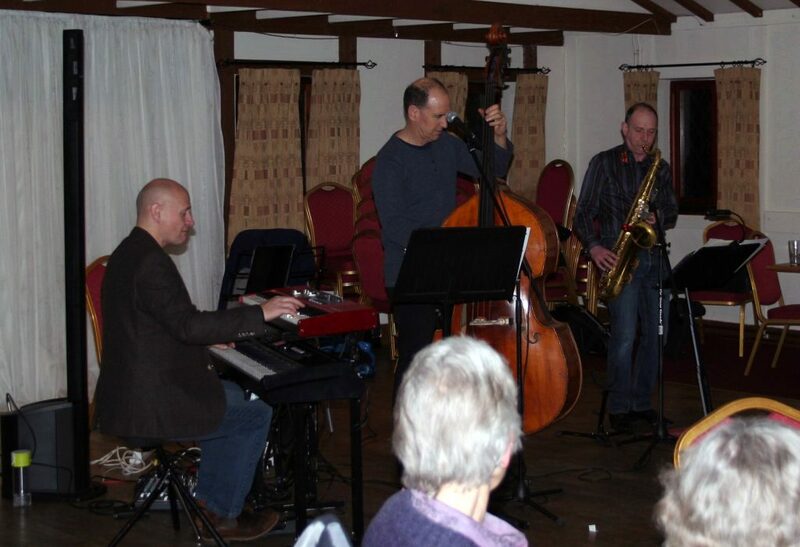 But in this case it was a glowing compliment to Richard’s quintet and since the visitor was from the South of England, would the band like to play at her local jazz club? Who knows, this evening might well have paved the way for more jazz gigs in some other areas as well. I suppose that any review of a performance involving Dave Newton brings you to the point where you exhaust all the superlatives in the book. July’s session was no exception. Lest you think that this is my view and that I am biased, it is the audience who decide what they like and what is seen as good music. I suppose then, some of the comments that were made by members of the audience as they were leaving will be this month’s review. One person suggested that a Newton evening of music like this could be used as an illustration of what jazz is all about for those who say they ‘don’t like jazz.’ It was accessible music with a universal appeal. Then there were the ‘that was wonderful’ and the ‘when is he coming again’ and the ‘that really was worth coming out for’ comments which are always lovely to hear. On an extremely hot evening when staying in the garden with a cool drink might be more comfortable, those comments are even more genuine. I was equally impressed by the couple who had travelled over one hundred miles to be there. In fact they were spending a break in the area and they had timed their visit to coincide with Dave’s visit. That is dedication and it also says a lot about the draw of the music and of his artistry. 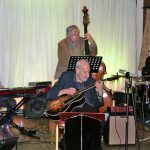 Dave was with Clive Morton on bass and Terry Howard on drums. It’s not only fascinating to listen to these guys design their music as they go along, but it’s also visually exciting to watch their facial expressions and subtle signals to each other which indicates, to them at least, what is coming next. What a team and what a wonderful evening of great music. Like fine wine, there were flavours of everyone from Bill Evans to Oscar Peterson and all points in between. At the same time, a really fresh originality oozes from every note. Last Monday was a fairly easy evening musically to put together. Play what the audience likes (always a good idea), based on knowledge gained from experience. And that experience was so evident with John Hallam who has done it, been there and I guess has a vast number of tee shirts to prove the point! The programme had been put together by John Hallam and it was all music that the audience knew and in most cases loved. 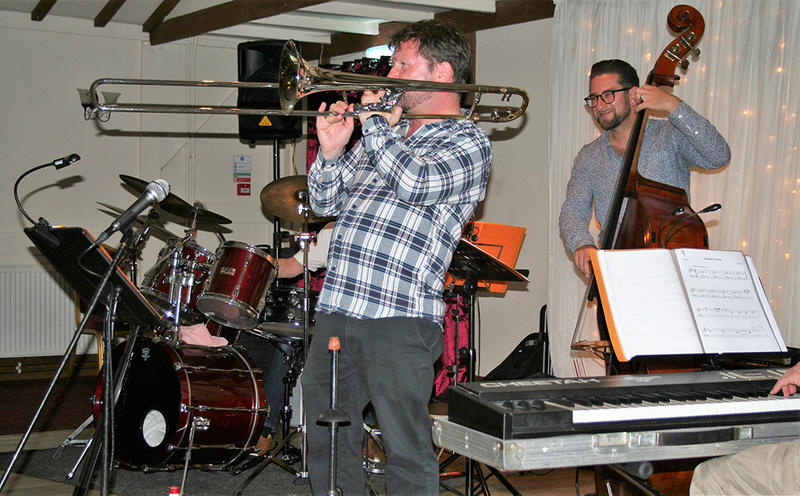 None of it was hackneyed and all of the musicians were enjoying themselves – it wasn’t just another job to them. The same goes for the audience. They loved it and they said so as they were leaving. Of course, an evening of that standard must be supplemented by some anecdotal stories or jokes. Should we perhaps call them anecdotes with punch lines? John has a wealth of stories, many of them things that have happened to him. So first hand stories have that ring of credibility that certainly added to the evening. 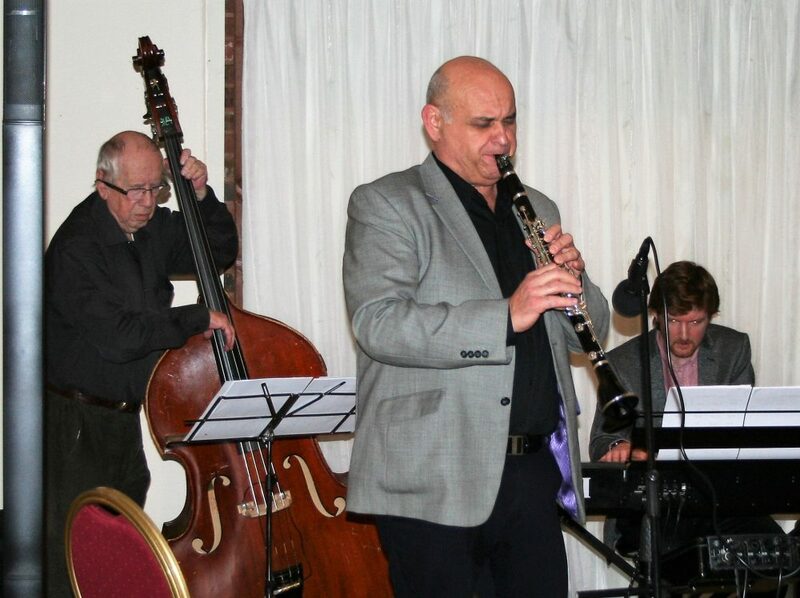 Again an evening of excellent jazz played by musicians who know and enjoy the music and that enjoyment is then transmitted to the audience who also thoroughly enjoyed the evening’s entertainment. Simple maybe, but isn’t making it look easy is surely the mark of true professionals. Last Monday evening was an evening of standards (and favourites) superbly delivered by a trio of musicians, two of whom did not grow up with this music. The music was well known to the bass player and leader of the trio, but the pianist and drummer played them like they had known them all their lives. New to Severn Jazz audiences was pianist Tom Berge who has had lessons from David Newton and judging by his inventiveness they certainly had some effect. He is far from being a Newton clone but you hear how he is able to squeeze the best out of any tune without destroying the fabric of that tune. Drummer Billy Weir was in full control all the time and not one did he take over the proceedings. His credentials are that he won the Tony Levin drum prize for the most ‘swinging drummer.’ Well deserved. Tom did most of the announcing and he endeared himself to the audience by admitting that he wasn’t always sure of who wrote what and when. And of course, they helped with suggestions from the floor. The moral of all this is don’t dismiss names that are not well known because it’s considered they will not come up with a good evening’s jazz. This bank holiday Monday session would prove any doubters wrong and provide those that did come and listen with some eye-opening jazz. 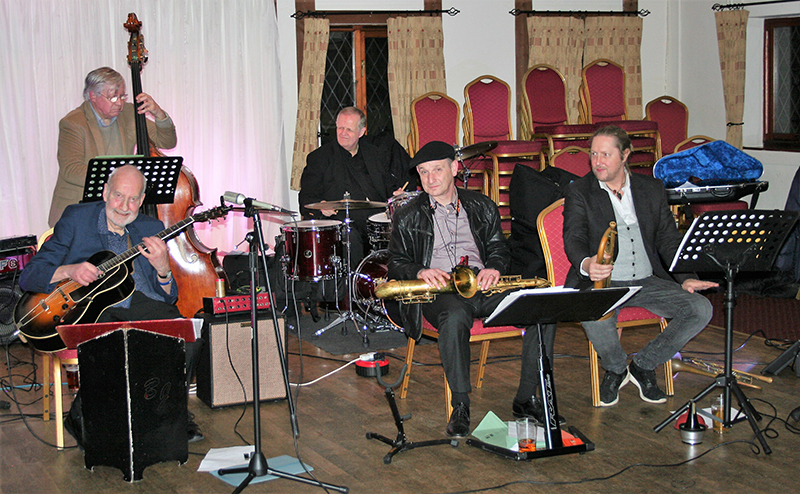 A great evening of good jazz was enjoyed and so many people said so as they went home that evening. Booking any kind of entertainment way in advance is always a risky business. What if it rains? What if the road is closed? What if all manner of disasters occur? You can go on forever asking, what if? So to book a band of six professional musicians to play jazz on an Easter Monday could be classed as risky, very risky, especially as nearer the date it was found there was also the possibility of snow on that day. Snow at Easter? Surely not! This is, after all our wonderful British weather, so why not? Now the main worry is that no one would turn up to listen just in case the weather was bad. Perhaps they would be still away or returning from their Easter break. Not so in this case. A capacity audience turned up and the large car park was unusually full! A couple of the musicians nearly didn’t turn up for various reasons beyond their control and nails were beginning to be bitten to the quick, but it all turned out right in the end. And that was the point at which the clouds went away and the sun came out and the day was a gorgeous one, metaphorically speaking. This is what happened on the Easter Monday session when Roy and his rhythm chiefs started to play. What a band. Based on some of the tightly arranged small bands this six-piece must have had the carpet down its backing in a number of places due to the tapping of feet. 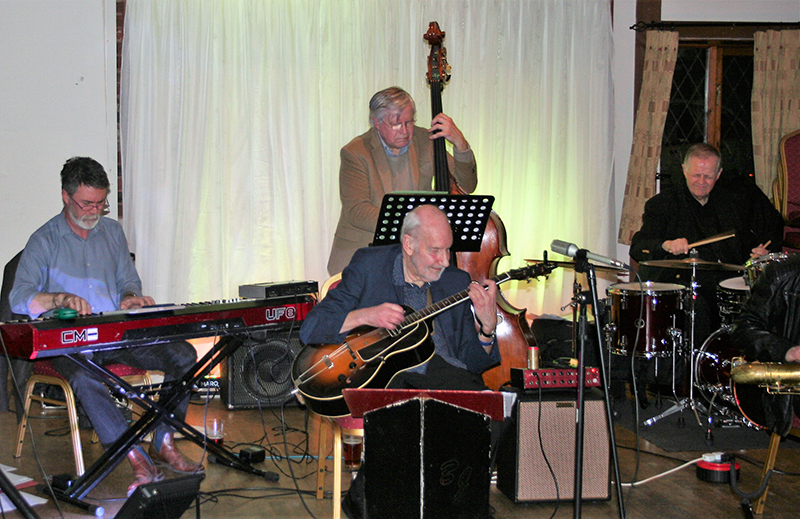 It may be a six-piece but this allowed for a number of trio spots featuring Dave Newton, guitarist and leader Roy, bassist Bill Coleman and drummer Mal Garrett. This band was almost as on their album, except on this occasion with Bill Coleman stepping in for Tom Hill. 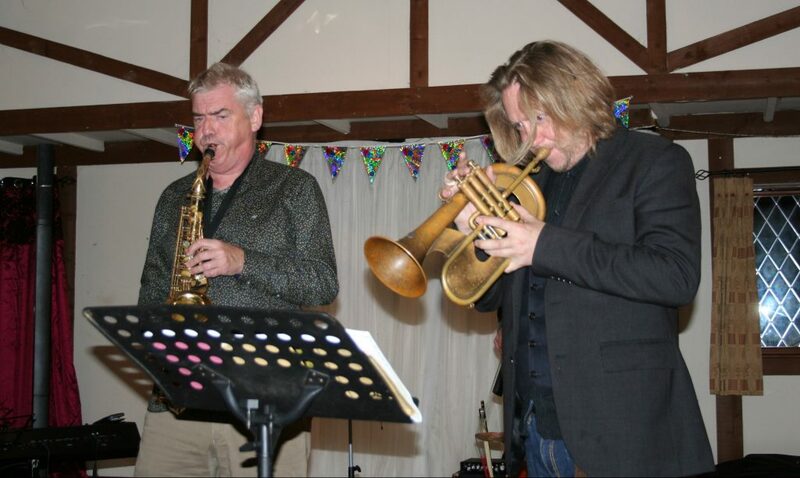 All the other musicians were the same as the CD personnel; Bryan Corbett and Charlie Wright occupying the trumpet and saxophone chairs. They even played the music that comprised their CD and how good it was to hear a live band of that standard in full flight. 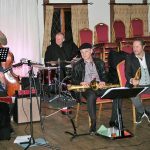 They played a mixture of jazz standards with a few well chosen home-brewed compositions which did not stand out as being fillers in any way. Roy told the stories of how he met the musicians in the band and that just added to the entertainment. People left that night with a combination of smiles on their faces and glazed eyes – both emotions because they had enjoyed their evening so much. Many also said as much as they left. After all, if you check out the calibre of artists this band plays with as individual musicians; if you reel off the list of household names who they accompany now or have backed in the past, then you will realise just how high the standard of musicianship that was on stage that night. We don’t live in a big city environment so how lucky we are to be able to see and hear this standard of jazz within easy reach of where we live. Jazz has always been a fun music, but there are those who take it very seriously and musicians sometimes need to careful and decide whether their talents are better used playing music as distinct from telling jokes. But there are those musicians who can mix the two. And they do it so well with excellent timing and their funnies do not detract from the music. 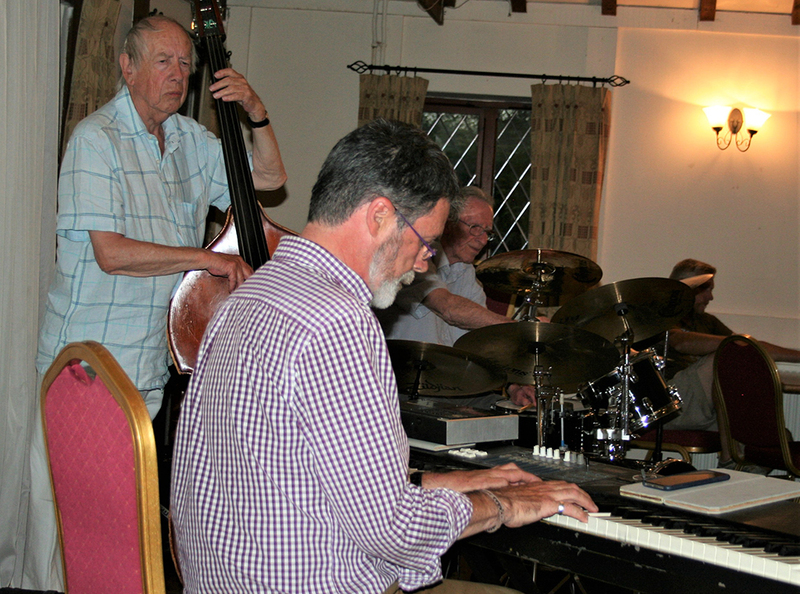 One of these is Tom Hill and with Al Gurr playing keyboards and Charlie Wright on tenor sax, the team for making music is complemented by the humour. This was the basis of the first Monday evening in February when the trio came to play. And the evening was not just an endless landscape of the great American songbook and many other tunes that we had all heard a dozen times before. No, this two hours took in the unusual and obscure. For instance, Grandma’s Hands and a dedication to the NHS, New Cross. The former was sung by Tom and it was a Bill Withers composition about his grandmother and written and recorded in 1971. New Cross was written by Tom and he explained how he had undergone heart surgery a couple of years ago and how grateful he would always be to our NHS. His introduction was delivered with great passion and the tune was made more moving after that explanation. New Cross is the hospital in Wolverhampton where Tom had his surgery. In amongst the unusual and obscure there was still a lot of good music which everyone seemed to enjoy. There was a superb version of Mood Indigo and a fascinatingly different I’ve Never Been In Love Before with an original piano introduction then some interplay with Charlie Wright’s tenor and then some delicious bowed bass. 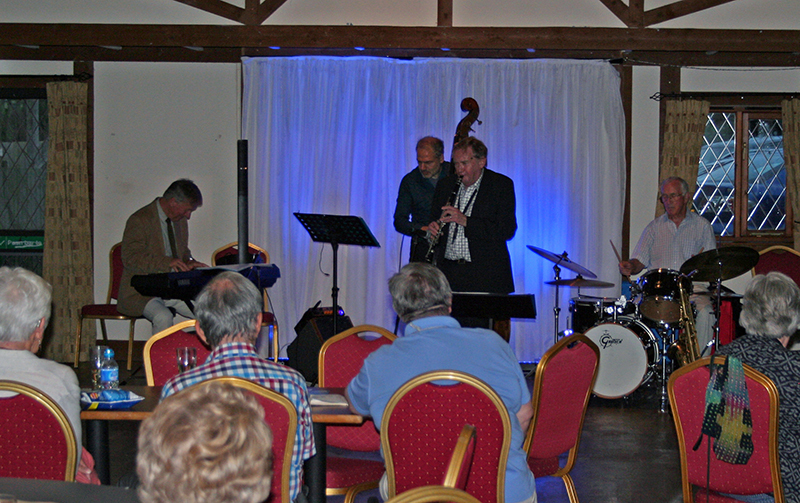 Altogether it was a cracking evening of jazz with some fun which kept the evening going at a brisk pace. David Newton and his audience go together like they’ve always known each other for years. Like neighbours who can chat over the fence about anything and everything and are comfortable in each other’s company. He doesn’t tell jokes. He has no clever links between the music. He is just a nice, down to earth guy who has this phenomenal talent – he plays superlative jazz piano with notes that entertain and leave everyone spellbound. His evening started with about three tunes without any links between. When it came to tell everyone what he’s played he remembered the last one, but forgot the first two. It didn’t matter. We all felt we knew him enough that it didn’t really matter. So everyone laughed and we carried on with the next number. It really did feel like an intimate evening with friends where everyone knows everyone else and no one has to be careful what they say and do. Every time a new number started, someone in front of me mouthed the title. It was almost like a competition, a guessing game which was good fun. There were also times when the excellently empathetic bassist and drummer, Clive Morton and Terry Howard would have to pick up after a long introduction. They did, and did so faultlessly as if they had rehearsed that part a million times and yet it was still so spontaneous and fresh. There were also wonderfully inventive versions of well known songs. The Girl From Ipanema springs to mind. That started as just a ‘bossa’ and then morphed into what it was supposed to be. Where does all that creativity come from? The audience as they were leaving were nothing but complementary and although the evening was a great success musically, the attendance wasn’t as good as expected. Perhaps that was due to the change of date or evening that the night was more than chilly. Whatever the reason, it was obvious that those who were there really enjoyed what the trio had to offer – and they said so.